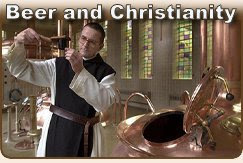 Now don't get me wrong, my first batch of beer was excellent. Better than your average store bought beer, despite a number of errors I made in the brewing process. I thought for sure my airlock incident would have doomed my beer, but all was well. I just hoped to document the entire process and spring board my efforts into a regular hobby. Sadly, I proved to be lazy. When is the right time to bottle your beer? I've read that fermentation normally takes 3-5 days, but it's better to leave the beer in the fermenter for an extra 5-7 days to produce a beer with better clarity. 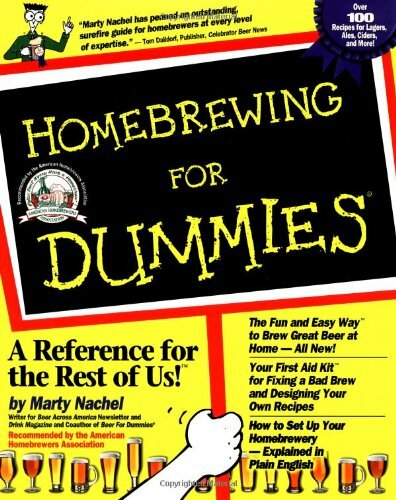 All the homebrewing resources will tell you about your hydrometer readings, and how important they are. I'm embarrassed to admit this but, I had a difficult time reading my hydrometer. I pretty much guessed at what my initial and final reading were. I was more concerned about contaminating the brew, and got easily frustrated when dealing with my hydrometer. I can tell you however, when this batch was completed, it tasted great and had plenty of alcohol in it, hydrometer be damned! For the life of me I can't remember how long I waited, but I can tell you I kept my eye on that damn airlock. The bubbles came at a steady pace and then, days later, eventually slowed nearly to a complete stop. I would tackle my hydrometer short comings on the next batch, or so I thought. Do they have digital hydrometers? At any rate, bottling time was right around the corner. I had been collecting empty beer bottles for over a month. I needed help emptying enough bottles of store bought beer to bottle up 5 gallons of my own homemade brew. Fortunately there was no shortage of volunteers to help me in that task. My saint of a wife humored me as I started this new hobby, and allowed me to store a frat house worth of empties on top of our kitchen refrigerator. Every time someone closed the fridge, the sound of empties clinking against each other rang through the house. As my wife will tell you, when entertaining friends and family, nothing says "class" more than a kitchen full of empties. When bottling day came, I faced the daunting chore of sanitizing all of those empties. Oddly enough, all those volunteers that so willingly helped me empty those bottles were nowhere in site. It's ironic, I love beer but I hate cleaning. And keeping your equipment and bottles clean is essential to making beer. This personal weakness could prove to be my undoing when it comes to realizing my goal of becoming a brew-meister. I tried to clean each bottle individually in the kitchen sink using a water and C-Brite mixture, but the tedium of this task was too dull for me to continue at this snail's pace. The sooner I got the beer bottled the sooner I'd be drinking it. What's C-brite? 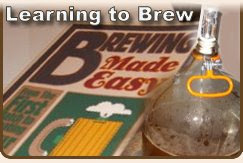 C-brite is a no rinse one step sanitizer and cleaner often used by homebrewers. After washing a couple of bottles the slow way, I found myself in the bathroom, filling a large Rubbermaid storage bin with a water and C-brite mixture. The bin was large enough to sink all my bottles and let them sit in the mixture for a bit. Now this part was comical. Picture a man trying to sink empty beer bottles, 5 or 6 at a time. If I were ever stuck on that island from lost, and those "Dharma Initiative" guys dropped off a pallet of beer, I'm convinced I could construct a sea worthy vessel out of the empties. Those puppies want to float. Once I got the bottles, my bottling bucket and the bottle filler and siphon cleaned, it was time to bottle my beer. First I had to pour my beer from the fermentation bucket to the bottling bucket. But back to the bottling... This is where the carbonation comes in. The recipe kit came with priming sugar (dried malt extract). The instrucitons told me to boil the sugar in a little water and cool it. Then, add it to the empty (cleaned and sanitized) bottling bucket. Then I used siphon to transfer the beer from the fermentation bucket to the bottling bucket, where the beer will meet the priming sugar solution. It's the solution that will "wake up" the yeast. It's key to avoid getting any of the sediment from the fermenter into the bottling bucket. From what I 'm told, that stuff can really make your beer bitter. 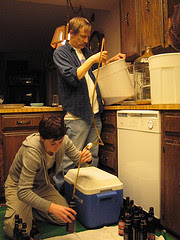 Once the beer is in the bottling bucket, the idea is to connect a hose to the spigot at the bottom of the fermentation bucket, and connect the bottle filler to the other end of the hose. The beer will flow down the tube into your bottles, once you open the spigot, with the help of a little thing I call gravity. The bottle filler is a brilliant yet simple idea. As you place the hard plastic tube into your beer bottle, the plug at the end is pushed up, allowing for your brew to flow. As your bottle is nearly full, you simply lift the filler and it's plug will close up. You need to leave a little empty space on top to allow room for the carbonation your yeast will be making after you cap the bottles. Now it was time to cap the bottles. Fortunately my starter kit included a bag of caps and a two handled capper. Capping your beer properly, as I would find out during my next batch, is critical. If a bottle is not capped properly, your beer will go bad. I'll be frank, the two handed capper I had sucked. You need to apply equal pressure with both hands, while holding the bottle in place. Do you see the problem there? Where does that third hand come from? I found myself using my crotch as a bottle vice. That's a part of the process I kept from my tasting volunteers. Meh! Serves them right, where were they when I needed help? After I bottled my brew I brought them back down to my basement, which seems to stay at a constant temp all year round. I tucked them in for a two week nap and covered them in dark plastic to keep harmful light away from them. A couple weeks later, I opened my first bottle and it was perfect. 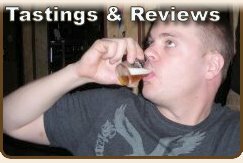 Even my wife liked the flavor, and at the time, she was not a fan of beer. Really good stuff! With one successful batch of home brew under my belt, it was only a matter of time before I tried again.